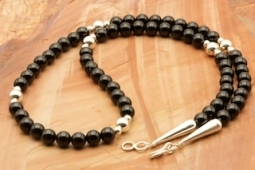 22" Necklace featuring Genuine Black Onyx Beads accented with Sterling Silver Beads and Clasp. Created by Navajo Artist Petra Vandever. Necklace is 22" long with 7mm Beads.